Watch the Skies | 41 Lumber - Serving Iron Mountain and the U.P. Just about everyone in home improvement hates to climb a ladder when they’re on a sales call. Enter drones. They’re not just toys anymore. Instead, drones are becoming must-have sales tools for aggressive exterior remodeling companies, which are using them in all phases of the sales and marketing process. Roofman USA, of southeastern Michigan, is one of the exterior remodeling companies leading the charge with drone technology. Co-owner Karson Greaves has incorporated drone videos into the company’s sales and marketing processes. The use of drones doesn’t stop at sales. Drones make for great marketing material, as they can capture video from various angles before work begins, during the renovation, and after the new roof is installed. 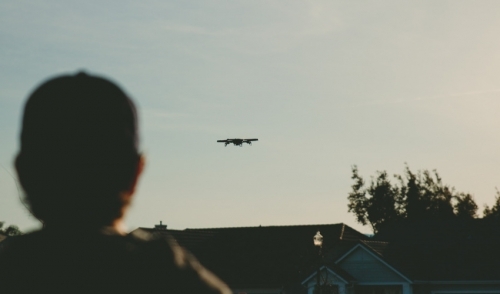 While the earliest uses for drones are on the sales and marketing side, new innovations are coming. The widespread use of drones to take accurate, comprehensive measurements of an exterior is just around the corner. This will also streamline materials purchasing. So while drones may seem like a lot of fun to play with (and they are), they are also evolving into multi-functional business tools that will be standard issue around the industry in years to come. Watch the skies.